New Skatepark Designs – Decision Time! Seaford Town Council is now in receipt of three exciting designs for the new skatepark to be built in The Salts recreation ground. 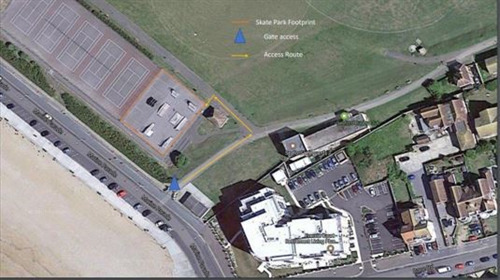 Seaford Skatepark Association has been consulted on the criteria for the tenders, and the Council would now like to invite skaters, park users and residents to put their thoughts and views forward on which design should be built. Come and have your say on Saturday 14th October, from 10.00 to 14.00, at The Salts Café. Craig Williams, Seaford Town Councils Projects & Facilities Manager, will be on hand to answer any questions you may have. A questionnaire will be available on the day and also on Seaford Town Council’s website so that everybody’s opinions can be taken into account. Richard Lamprell, of Seaford Skatepark Association, is keen that as many people as possible submit their views. "This is an excellent opportunity for you to be involved in choosing not just who builds our skatepark, but exactly how it turns out, and what obstacles it includes, so make sure to come down and have your say!" The skatepark is to be built at no cost to the taxpayer, with funds derived from the Martello Place development opposite Seaford station. Section 106 requires a payment is made from developers to Seaford Town Council for social and community projects. In this case a total of £165,625 has been secured for a new skatepark to be located in the nearby Salts.